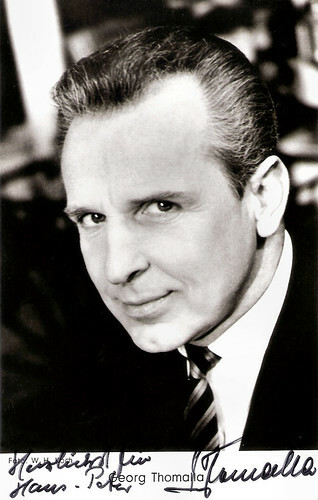 German actor Georg Thomalla (1915-1999) was one of the most popular and prolific character comedians of the post-war German cinema. Thomalla was also known in Germany for dubbing Peter Sellers as Inspector Closeau and Jack Lemmon from 1955 to 1998. Austrian postcard by HDH-Verlag (Verlag Hubmann), Wien, no. 4907. Photo: Fonofilm / Gloria Verleih. 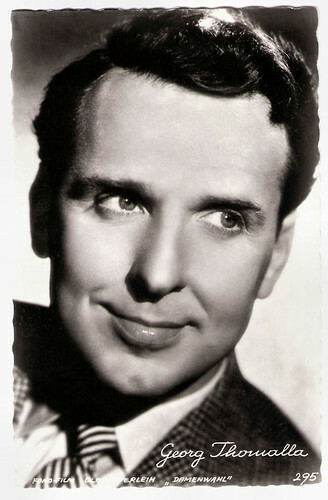 Publicity still for Damenwahl/Lady's Choice (E.W. Emo, 1953). German postcard by Rüdel-Verlag, Hamburg-Bergedorff, no. 1160. Photo: Real / Europa-Film / Filipp. Publicity still for Die Stadt is voller Geheimnisse/City of Secrets (Fritz Kortner, 1955). Austrian postcard by Austrimport, Wien, no. 142. Photo: Fono / Gloria-Film / Marczalek. Publicity still for Damenwahl/Ladies' Choice (E.W. Emo, 1953). Georg Valentin Thomalla was born in Kattowitz, Upper Silesia, German Empire, in 1915. He began his career as an apprentice cook. 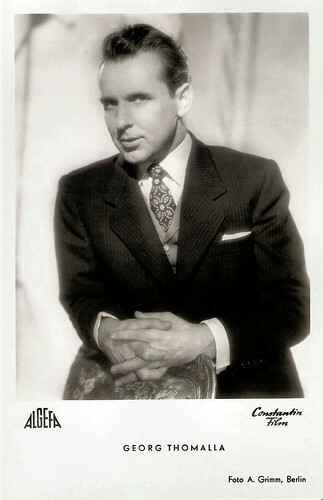 In 1932, he joined a theatrical troupe and, before long, acted on stage in Berlin. With a bit part in Ihr erstes Erlebnis/Her First Experience (Josef von Báky, 1939), he made his film debut. 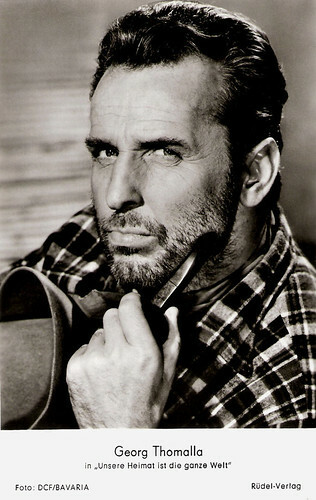 During the Second World War he appeared in the propaganda film Über alles in der Welt/Above All Else in the World (Karl Ritter, 1941) starring Paul Hartmann, Hannes Stelzer and Fritz Kampers. The title refers to the second line of the German national anthem. Following the outbreak of war, Germans abroad face persecution from the British and French authorities. The drama was designed to promote Nazi Germany's war aims in the Second World War. 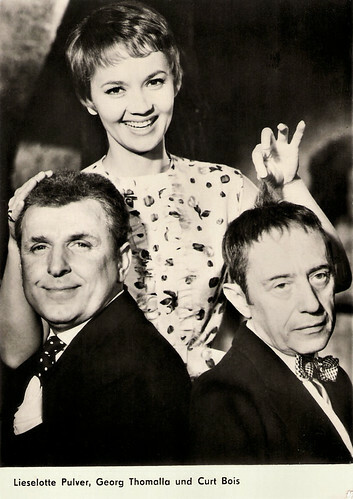 Thomalla had a supporting part in the revue film Wir machen Musik/We Make Music (Helmut Käutner, 1942), starring Ilse Werner and Viktor de Kowa. He had a smaller part in the Henrik Ibsen adaptation Nora/A Doll's House (Harald Braun, 1944) starring Luise Ullrich, Viktor Staal and Franziska Kinz. Rhomalla had a bigger part in the drama Solistin Anna Alt/Anna Alt (Werner Klingler, 1945). Anneliese Uhlig featured as a gifted pianist gives up her career to support her composer husband (Will Quadflieg). It was one of comparatively few films released in Nazi Germany in 1945, due to increasing difficulties of film production during the later stages of the Second World War. After the war premiered the crime comedy Peter Voss, der Millionendieb/Peter Voss, Thief of Millions (Karl Anton, 1946) starring Viktor de Kowa. 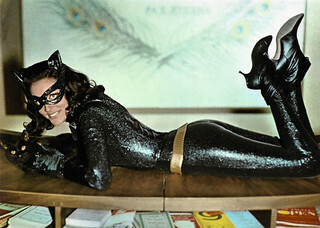 It was filmed between 1943 and 1945. The comedy Sag' die Wahrheit/Tell the Truth (Helmut Weiss, 1946), starring Gustav Fröhlich and Mady Rahl, had a troubled production. It was originally filming in the final days of the Nazi era with Heinz Rühmann and his wife Hertha Feiler in the lead roles, but production was halted when Soviet forces took control of the Tempelhof Studios during the Battle of Berlin. The film was then remade in the British sector of Berlin with different leads but using substantial amounts of footage already shot during the previous production. Thomalla’s next film was the comedy Herzkönig/King of Hearts (Helmut Weiss, 1947), starring Hans Nielsen.The film was the first production of Artur Brauner's CCC Films, which would develop into a leading company in West German cinema. The film was made at the Tempelhof Studios in Berlin. He played another supporting role in the comedy Man spielt nicht mit der Liebe/Don't Play with Love (Hans Deppe, 1949) starring Lil Dagover and Albrecht Schoenhals. 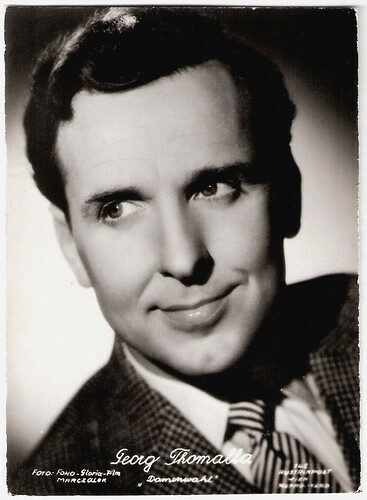 On stage, he became a celebrated star of cabaret, and was an ensemble member of the Kabarett der Komiker (Cabaret of the comedians) from 1948 to 1956. 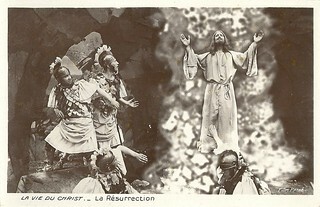 German postcard by Kunst und Bild, Berlin, no. A 984. Photo: Algefa / Constantin Film / Arthur Grimm. Publicity still for Bezauberndes Fräulein/Glamorous Miss (Georg Thomalla, 1953). German postcard by Graphima, Berlin. In 1951, Georg Thomalla had his breakthrough in the cinema as one of the two struggling musicians who join a women’s orchestra in drag in the West German comedy Fanfaren der Liebe/Fanfares of Love (Kurt Hoffmann, 1951). The film, in which he co-starred with Dieter Borsche and Inge Egger, is a remake of the French film Fanfare d'amour/Fanfare of Love (Richard Pottier, 1935). Later followed the most famous remake, Some Like It Hot (Billy Wilder, 1959) with Jack Lemmon in Thomalla’s role. For the German release of Some Like It Hot, Thomalla dubbed Lemmon’s character. 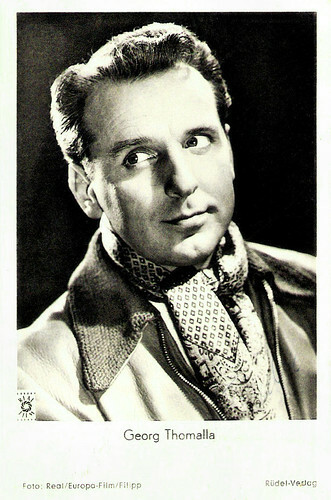 Thomalla was well known in Germany as a voice-over artist, dubbing particularly comedians. He was the standard German dubbing voice of Jack Lemmon from 1955 to 1998. 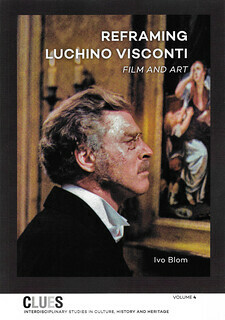 After Thomalla had dubbed Lemmon for more than 40 years, the two met at the 1996 Berlin International Film Festival where Thomalla held an honorific speech for Lemmon. Fanfaren der Liebe was a major hit, and a sequel Fanfare of Marriage/Fanfaren der Ehe (Hans Grimm, 1953) followed, showing the further adventures of the main characters. Bei Dir war es immer so schön/It Was Always So Nice With You (Hans Wolff, 1954) for example is a West German musical comedy starring Heinz Drache. In the crime comedy Meine Tante, deine Tante/My Aunt, Your Aunt (Carl Boese, 1956), he co-starred with Theo Lingen and Hans Moser. He also co-starred in the remake Viktor und Viktoria/Victor and Victoria (Karl Anton, 1957) with Johanna von Koczian as a woman, who gains success on the stage by pretending to be a female impersonator. The film was a remake of Viktor und Viktoria/Victor and Victoria (Reinhold Schünzel, 1933) with Renate Müller and Hermann Thimig in the role Thomalla took over. In 1982 Blake Edwards remade the film as Victor/Victoria and then based a stage musical on the film both starring Julie Andrews. Apart from comic side-kicks, Thomalla played his fair share of friends of the hero, a noteworthy example being Kara Ben Nemsi's (Viktor Staal) loquacious, but intensely loyal manservant and companion Hadschi Halef Omar in Karl May's Die Sklavenkarawane/Caravan of Slaves (Georg Marischka, Ramón Torrado, 1958). 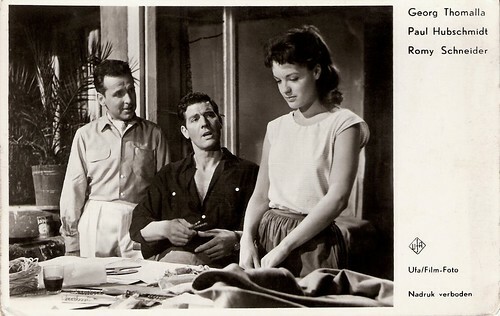 Though rarely seen in 'serious' roles, Thomalla gave a sensitive dramatic performance as a helpful truck driver in the East-West romance Himmel ohne Sterne/Sky Without Stars (Helmut Käutner, 1955). A popular success was the romantic comedy Scampolo (Alfred Weidenmann, 1958) with the young Romy Schneider. Dutch Postcard by Gebr. Spanjersberg N.V., Rotterdam. Photo: Ufa/Film-Foto for Scampolo (Alfred Weidenmann, 1958) with Paul Hubschmid and Romy Schneider. German postcard by Rüdel-Verlag. Photo: BCF / Bavaria. Publicity still for Juanito (Fernando Palacios, 1960). East-German postcard by VEB Progress Filmvertrieb, no. 1547, 1961. Photo: publicity still for Das Spukschloss im Spessart/The Haunted Castle (Kurt Hoffmann, 1960) with Liselotte Pulver and Curt Bois. In 1960, Georg Thomalla co-starred with Liselotte Pulver in the comedy Das Spukschloß im Spessart/The Haunted Castle (Kurt Hoffmann, 1960). It was entered into the 2nd Moscow International Film Festival where it won the Silver Prize. The film is a sequel to Das Wirtshaus im Spessart/The Spessart Inn (Kurt Hoffmann, 1958) and was followed by Herrliche Zeiten im Spessart/Glorious Times in the Spessart Inn (1967). Thomalla also appeared in the Schlagerfilm Ramona (Paul Martin, 1961) with Senta Berger and The Blue Diamonds, the comedy Bei Pichler stimmt die Kasse nicht/Pichler's Books Are Not in Order (Hans Quest, 1961) with Theo Lingen, and Der Traum von Lieschen Müller/The Dream of Lieschen Mueller (Helmut Käutner, 1961) featuring Sonja Ziemann. Then followed two Operetta films Die Försterchristel/The Forester's Daughter (Franz Josef Gottlieb, 1962), starring Sabine Sinjen and Peter Weck, and Der Vogelhändler/The Bird Seller (Géza von Cziffra, 1962) with Conny Froboess. Later, his film parts became smaller such as in Lausbubengeschichten/Tales of a Young Scamp (Helmut Käutner, 1964) with Hansi Kraus, the romantic comedy Ich suche einen Mann/I Am Looking for a Man (Alfred Weidenmann, 1966), and the comedy Zur Hölle mit den Paukern (Werner Jacobs, 1968), starring Hansi Kraus and Theo Lingen. 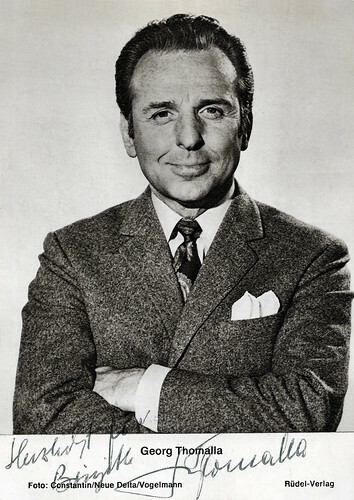 From 1961, Thomalla devoted more and more time to appearing in television and to voice-over work. He starred in his own half-hourly TV show, Komische Geschichten mit Georg Thomalla (1961-1971), in which he played an average Joe afflicted by middle-age angst and confronted by a variety of everyday problems. He was the German dubbing voice for Bob Hope, Danny Kaye, Jack Lemmon and Peter Sellers as Inspector Closeau in the Pink Panther films. Thomalla’s later films were mediocre comedies like Auch ich war nur ein mittelmäßiger Schüler/I Wasn't a Very Good Student Either (Werner Jacobs, 1974) about two men waiting for their wives to give birth, who reminisce about their school days, and Der Tiefstapler/The low-loader (Karl-Heinz Bieber,1978) with Gert Fröbe. 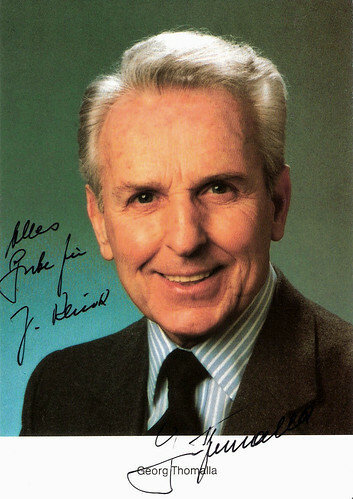 In 1985, Thomalla was awarded the German Federal Cross of Merit. He was interested in religious question and in Eastern philosophy. From the mid-1980s he was a member of the ISKCON (the Hare Krishna movement). His final film was Lilien in der Bank/Lilies in the bank (Marianne Rosenbaum, Gérard Samaan, 1996) with Katharina Thalbach and Nina Hagen. Georg Thomalla died in 1999 of heart failure in Starnberg, Bavaria, Germany. He was 84. From 1957 he had been married to Margit Mayrl. They had two sons. German postcard by Rüdel-Verlag, Hamburg, no. 5187. Photo: Constantin / Neue Delta / Vogelmann. Publicity still for Einer spinnt immer/One is always nutty (Franz Antel, 1971). Scene with Dieter Borsche and Georg Thomalla in Fanfaren der Liebe (1951) (No subtitles, sorry!). Source: LadyViolet7 (YouTube). Sources: I.S. Mowis (IMDb), Wikipedia (English and German) and IMDb.